You are here: Home > News > Waterside Station: Back On Track? Waterside Station: Back On Track? UAHS is delighted that the Infrastructure Minister, Chris Hazzard, has announced that the listed Waterside Station will be the core of a new transport hub for Derry~Londonderry by 2020. 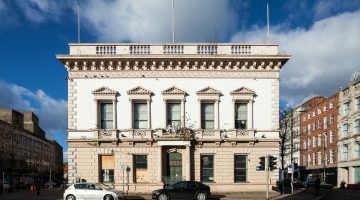 The building has been on the Built Heritage at Risk Register for Northern Ireland since 2012. Since as early as 2011, the Society has been closely involved in discussions on the options for a new transport hub with the position that a heritage led scheme based on the listed Station represents maximum benefit to the historic city. In numerous meetings with senior elected representatives of all the parties, community interests, Translink management, and architects, it was gratifying to observe a developing consensus in favour of Northern Ireland’s last intact railway terminus station. UAHS has also been in correspondence with the current owners of the building as a component of the debate and we are very pleased that an accommodation appears to have been reached in relation to a sale. The Society will remain closely involved as detailed plans emerge, to help to ensure the best use of the historic fabric and appropriate outcome of final design. It is hoped that the regeneration of the Waterside station reflects an emerging realisation within central and local government of the value of the remaining built heritage stock as an irreplaceable National Asset. The Old Northern Counties Railway Terminus is a prominent landmark building located at the bottom of Bond’s Hill on the east bank of the River Foyle. Built in 1873 to the designs of John Lanyon (of Lanyon, Lynn and Lanyon) the two-storey Italianate structure comprises of a boulder-faced squared sandstone façade. 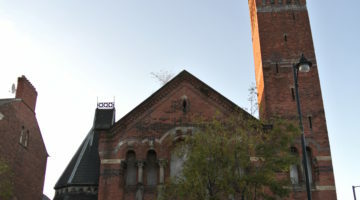 One of the key listed features of the building is the principal clock tower. The clock tower and part of the façade were demolished after bomb damage in 1974 and a glass extension has since been incorporated to the central portion of the front façade. Until recently the unoccupied building was deemed in good order, but recent vandalism has left the building in a vulnerable state, with lead flashing now removed from the main roof. Since the building’s closure as part of the railway network in 1980, it has housed a number of uses including a radio station, furniture store and showroom. Refs: ‘North West Ulster’ by Alistair Rowan, 1970, p405; UAHS ‘Historic Buildings- City of Derry’, 1970, p47; ‘The Industrial Archaeology of Northern Ireland’ by W.A. McCutcheon, 1980, p123. 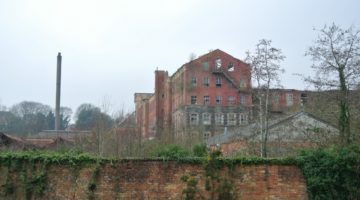 Hilden Mill- Hope for a Heritage Led Future? UAHS welcomes the news that Barbour Campbell’s Mill, Hilden has been acquired by a new owner. The Society hopes sale spurs Hilden's long awaited heritage led future. 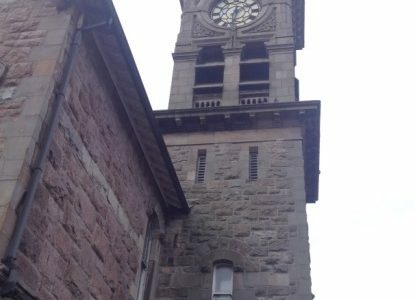 New Future for Former Methodist Church? Approvals have been granted for well known building at risk, former Methodist Church at University Road to be turned into a public house. With a proposed spend of £2 million by established chain JD Wetherspoon. 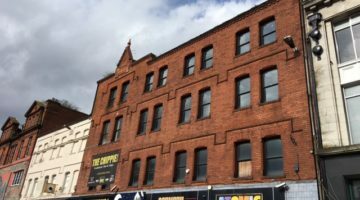 As demolition in the area of Upper North Street continues, unabated, this weekend, a deadline approaches for phase one of consultation on plans to remove yet more of Belfast’s built heritage.